Parnell, R. and Pitsikali, A. (2019) ‘The Public Playground Paradox: “Child’s Joy” or Heterotopia of Fear?’ Children’s Geographies. ISSN 1473-3285 (In Press) Copy on request. Literature depicts children of the Global North withdrawing from public space to “acceptable islands”. Driven by fears both of and for children, the public playground – one such island – provides clear-cut distinctions between childhood and adulthood. Extending this argument, this paper takes the original approach of theoretically framing the playground as a heterotopia of deviance, examining –for the first time – three Greek public playground sites in relation to adjacent public space. Drawing on an ethnographic study in Athens, findings show fear to underpin surveillance, control and playground boundary porosity. Normative classification as “children’s space” discourages adult engagement. 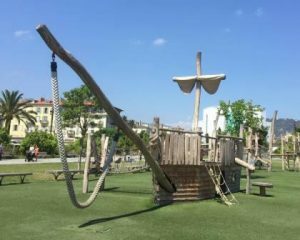 However, in a novel and significant finding, a paradoxical phenomenon sees the playground’s presence simultaneously legitimizing playful behaviour in adjacent public space for children and adults. Extended playground play creates alternate orderings and negotiates norms and hierarchies, suggesting significant wider potential to reconceptualise playground-urban design for an intergenerational public realm.